As Israel and Palestine suffer a hideous new spasm of terror, misery, and mayhem, it is important to ask how this situation came about. Perhaps an understanding of recent events will afford lessons for the future. How did the recent ceasefire unravel? The mainstream media in the US and Israel places the blame squarely on Hamas. Indeed, a massive barrage of Palestinian rockets were fired into Israel in November and December, and ending this rocket fire is the stated goal of the current Israeli invasion of Gaza. However, this account leaves out crucial facts. 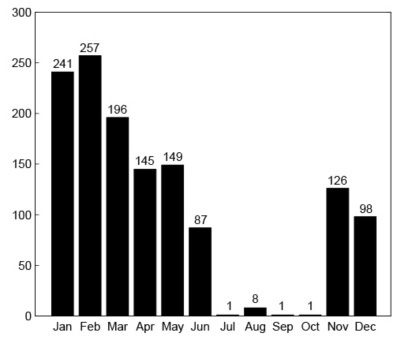 First, and most importantly, the ceasefire was remarkably effective: after it began in June 2008, the rate of rocket and mortar fire from Gaza dropped to almost zero, and stayed there for four straight months (see Figure 1, from a factsheet produced by the Israeli consulate in NYC). So much for the widespread view, exemplified in yesterday's New York Times editorial that: "There is little chance of restraining Hamas without dealing with its patrons in Syria and Iran." Instead, the data shows clearly that Hamas can indeed control the violence if it so chooses, and sometimes it does, for long periods of time. Second, and just as important, what happened to end this striking period of peace? On November 4th, Israel killed a Palestinian, an event that was followed by a volley of mortars fired from Gaza. Immediately after that, an Israeli air strike killed six more Palestinians. Then a massive barrage of rockets was unleashed, leading to the end of the ceasefire. Thus the latest ceasefire ended when Israel first killed Palestinians, and Palestinians then fired rockets into Israel. However, before attempting to glean lessons from this event, we need to know if this case is atypical, or if it reflects a systematic pattern. We decided to tally the data to find out. We analyzed the entire timeline of killings of Palestinians by Israelis, and killings of Israelis by Palestinians, in the Second Intifada, based on the data from the widely-respected Israeli Human Rights group B'Tselem (including all the data from September 2000 to October 2008). Thus, a systematic pattern does exist: it is overwhelmingly Israel, not Palestine, that kills first following a lull. Indeed, it is virtually always Israel that kills first after a lull lasting more than a week. Second, if Israel wants to reduce rocket fire from Gaza, it should cherish and preserve the peace when it starts to break out, not be the first to kill.